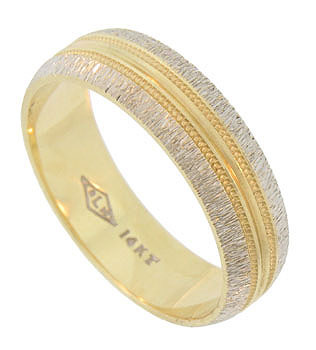 This handsome estate wedding band is crafted of 14K yellow gold. The center of the band is rounded and flanked by impressed strings of distinctive milgrain design. 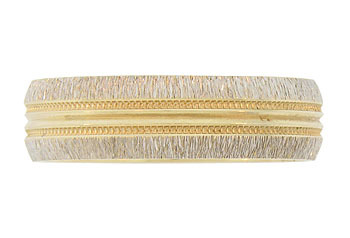 The edges of the ring feature an uneven horizontal jewel cut surface frosted in white gold. The wedding ring measures 5.98 mm in width. Circa: 1950. Size 9 3/4. We cannot re-size.